UID be linked to the parents’UIDs in the database and the child’s ID is not issued on the basis of deduplication of his/her biometrics. This however, increases the risk of duplicates/fakes among UIDs for children. large number of them have eye-related ailments like cataract,according to data made available by the state government. Out of the total global population of visually challenged of 45 million, 12 million are in India. Children below 16 years account for 1.4 million cases of blindness in India. Hence , UID will actually exclude million of cases because of malnutrition-induced Cataract. Finger prints, too, would generate a lot of noisy data which may ultimately be unusable. 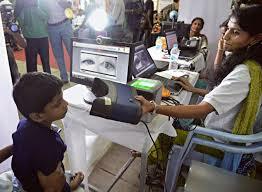 There are no existing standards for the creation / collection of biometric data in India and consequently no way to monitor the process. be carried into adulthood. This is especially important where the child has had a difficult growing up and may have encountered problems of being a `neglected child’ or a `child in conflict with the law’. These are specifically proscribed from being carried into adulthood,with good reason. The UID, with its ability to link up data bases poses a threat to this important area of personal safety and protection of the child. shortcomings in the existing system, but often its the case that any new system also comes with its own set of weaknesses some of which were not immediately evident. informed consent is an important element in public policy. the rules governing the collection and use of such data from young people. Article 2 of the CRC States Parties shall take all appropriate measures to ensure that the child is protected against all forms of discrimination or punishment on the basis of the status, activities,expressed opinions, or beliefs of the child’s parents, legal,guardians, or family members. shortcomings in the existing system, but often it is the case that any new system also comes with its own set of weaknesses some of whichwere not immediately evident. IS UID A MAGIC NUMBER ?